Crystal Palace Football Club acknowledges its duty of care to safeguard and promote the welfare of children. 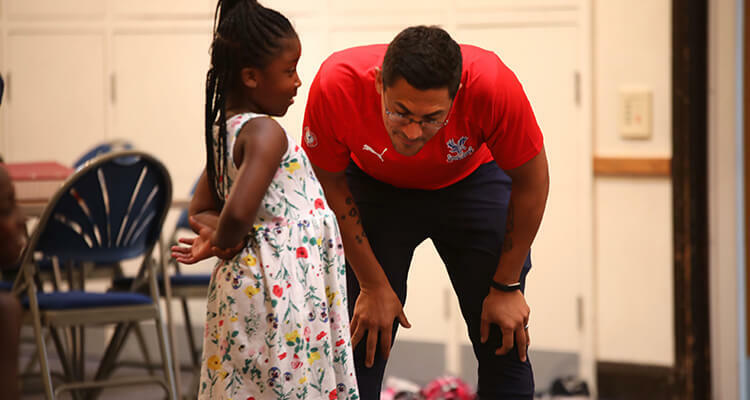 Crystal Palace Football Club acknowledges its duty of care to safeguard and promote the welfare of children. We will comply with all statutory obligations including the Working Together to Safeguard Children Act (2015) and section 11. When it comes to safeguarding children, we are committed to ensuring safeguarding practice reflects statutory requirements and responsibilities, government guidance, recognised best practice and complies with premier league and football league rules. The club expects all staff, players, volunteers, contractors and guests to share this commitment. The club employs a trained club-wide Head of Safeguarding and has designated safeguarding officers who implement, maintain and monitor best practice across the club. Our Head of Safeguarding also sits on and works closely with the Croydon Local Safeguarding Children Board. The Palace for Life Foundation is fully integrated into the club’s safeguarding provision. The Foundation regularly engages with high risk participants on programmes and projects. There is an awareness of potential danger for coaches and participants that is carefully risk assessed before they go ahead, ensuring that the staff have the correct level of expertise and that there are adequate supervision ratios. The Foundation works in partnership with a number of agencies who are specialists in a particular field such as education, mental health and law enforcement. Those partnerships complement the activities being delivered, but also ensure that risk is better managed by understanding potential issues of a particular group. All staff have received safeguarding training and all staff must update their safeguarding certificates every three years. All staff and sessional coaches undertake an enhanced DBS check, and this must be refreshed every three years. The Premier League monitors club compliance with its safeguarding children and adults at risk (vulnerable groups), as well as safer recruitment rules throughout each season via regular compliance visits. Clubs are expected to provide robust and consistent evidence that is truly representative of their safeguarding provision.